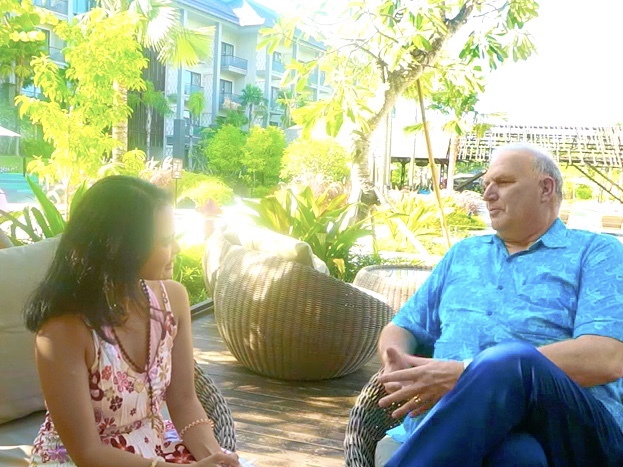 I feel very happy to have the chance to sit down and talk with Horst Walther-Jones, the General Manager of Mövenpick Resort & Spa Jimbaran Bali. We discuss about Mövenpick, its services, Bali, and himself. When I ask about the profile of Mövenpick, Horst says that Mövenpick Hotels & Resorts is a hotel management company headquartered in Baar, Switzerland. It started from restaurant business then expand to hotel and resort business. (Note: Jakarta has already two Marché Restaurants, a part of Mövenpick Group, in Plaza Senayan and Grand Indonesia). Mövenpick Hotels and Resorts started its business in Switzerland and Egypt, and now it expands its hotel and resort business worldwide. It operates more than 80 properties of hotels and resorts in Middle East, Europe and Asia. By 2020, it will build 30 more properties, especially in Asia. Mövenpick Hotels and Resorts takes Asia seriously as Asia is the market of the future and the economy in Asia is rising. Well, I am very proud to be an Asian! Yeay! Talking about the history of Mövenpick Resort & Spa Jimbaran Bali, Horst says that Mövenpick Resort & Spa Jimbaran Bali was opened in January 2017. It establishes itself as the resort for family. The biggest part of its facilities in the resort is for family around the globe. Horst explains that Mövenpick Resort & Spa Jimbaran Bali is different from the other hotels in Bali because of its services. As a resort, it is truly a great destination for family while it also provides room for non-family guests. As a true family resort, the family can come with clothes only and Mövenpick Resort & Spa Jimbaran Bali will provide the rest of the needs and the equipments for the family. It provides more privilege for the children as Mövenpick Resort & Spa Jimbaran Bali believes that the Mother and the Father are happy when their children are happy. 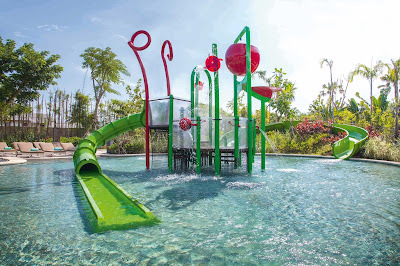 The kids can play in the area of Mövenpick Resort & Spa Jimbaran Bali, while the parents can have their private time at the same time and place. 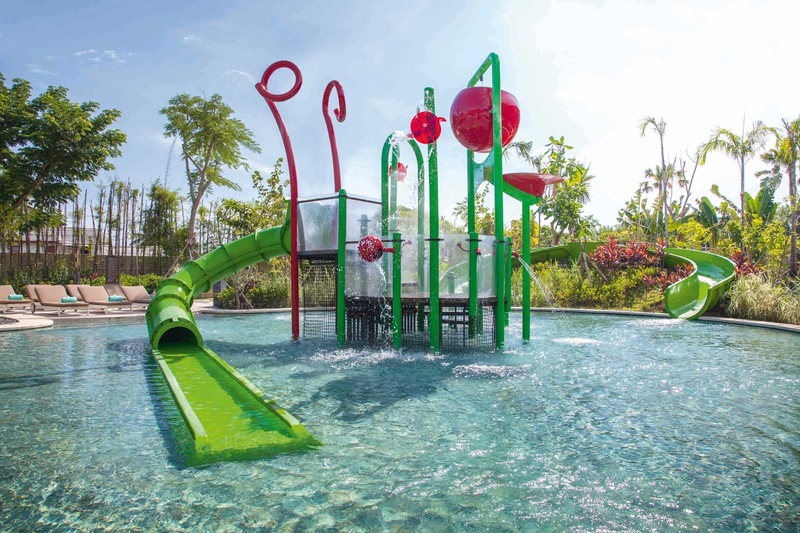 For the Parents and the whole family, Horst says that Mövenpick Resort & Spa Jimbaran Bali has Special Family Program that can make the whole family enjoy their holiday. It starts from the choices of room for family where children can sleep upstairs and family can sleep downstairs. For relaxation, it has Arkipela Spa that will pamper the guests with secret ingredients from all over the cities in Indonesia. For dining, the guests can go to Above Eleven Bali that has been chosen as one of the Best 5 Indonesian Restaurants in Bali. The restaurant has a rooftop bar where the guests can see the sunset at Jimbaran Bay - the best sunset spot in Bali. Mövenpick Resort & Spa Jimbaran Bali is only 2 minutes away from the Jimbaran Bay, the place for temples and other interesting spots. (Note: Above Eleven Bali is just one of the 5 restaurants located inside Mövenpick Resort & Spa Jimbaran Bali). Mövenpick Resort & Spa Jimbaran Bali also offers Everyday Chocolate Hour where the guests can taste Balinese Chocolate between 4 to 5 o’clock in the afternoon at its lobby. 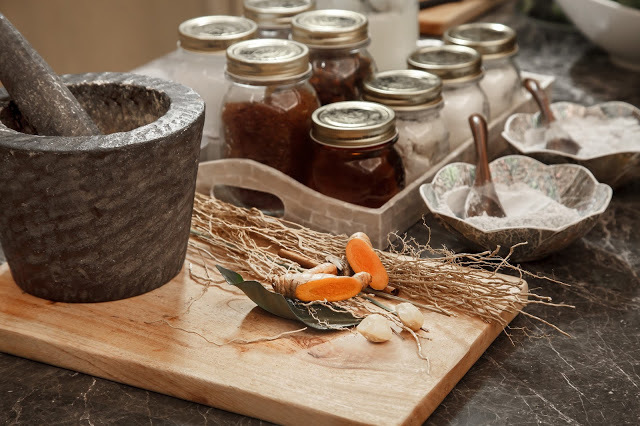 Chocolate is picked to be the jewel of Mövenpick Resort & Spa Jimbaran Bali because Mövenpick comes from Switzerland where it is famous for its chocolate, but it changes the chocolate to the Balinese Chocolate to respect its location in Bali. Through the Family and Children Program, Mövenpick Resort & Spa Jimbaran Bali has attracted more family to come to its resort, mostly from Asia, Australia, China, Singapore, Germany, Switzerland, and Italy. Horst believes that the service of Mövenpick Resort & Spa Jimbaran Bali is one of the best one in Bali. I myself can feel the warm welcome, the cozy lobby, the huge number of guests as I enter the lobby of Mövenpick Resort and Spa Jimbaran Bali. So yes, he is right! Horst explains that Mövenpick Hotels and Resorts is a holding company, and its business consists of Mövenpick Fine Food, Mövenpick Ice Cream, Mövenpick Wine, Mövenpick Hotels and Resorts, and many more. As it keeps growing following the business trend, the company has a commitment to expand more in Asia. In Indonesia, Mövenpick Hotels and Resorts plans to build 4 to 5 more hotels, including in Jakarta, Bandung and another one in Bali. In terms of service, Horst says that Mövenpick Hotels and Resorts has a solid standard of service, but still adaptable. It is more relax and fun for resorts, but it will come with different style of service if it builds its properties in business areas. Talking about the Corporate Social Responsibility, Horst says that one of Mövenpick Resort & Spa Jimbaran Bali’s missions in Bali is to take care of the community in Bali. He believes that Mövenpick Resort & Spa Jimbaran Bali would not be there without the role of the community. To give back to the community in Bali, Mövenpick Resort & Spa Jimbaran Bali has done some donations, like donating 50 million rupiah and other things for the victims of Mount Agung eruption in Bali and donating blood too. For the last Christmas 2017 event, it presented a Christmas Choir from the blind children to sing and celebrate the Christmas at the resort. Recently, Mövenpick Resort & Spa Jimbaran Bali donated some special computers for the blind children in Bali. Most of the donations are from its own initiatives, while it is always opened for its guests to participate in this social mission. Horst himself has one foster kid from SOS Children. Horst has been living in Bali for 2 years to watch over the development and the construction of Mövenpick Resort & Spa Jimbaran Bali and also to manage the resort. He arrived in Bali on January 2016. He has some experiences in the hotel pre-opening management, including the hotels in Dubai and Germany. As Horst and his family - one wife and 4 children - love Bali very much, he believes that Bali can do so much more. He believes that Bali has a good future and has still more potentials to reach. Amen for that! Thank you very much, Horst Walther-Jones and Mövenpick Resort & Spa Jimbaran Bali, for having me at your resort! All the information you share are very valuable, and I appreciate it! I hope to see you all again very soon!